The Saturday story over at ABC News was titled "Primal Fear As People Across Hawaii Get False Alarm Of Imminent Missile Attack" while the new story over at The Atlantic was even more appropriately titled "False Alarms Of The Apocalypse". And while both stories summed up 'the mood' and atmospheric panic which come about during a disturbance such as a false alarm of a nuclear missile inbound, we can't help but feel we may be witnessing something even more sinister playing out. Unknown to most, back on January 3rd of 2017, emergency warning sirens mistakenly went off all across the island of Oahu at approximately 8:07 a.m. according to Mel Kaku, the director of the Honolulu Department of Emergency Management. Called then an “inadvertent activation in the course of preparing for today’s scheduled test”, we find it very interesting that just over one year later, 8:07 a.m. was once again the time a 'huge mistake' was made in Hawaii, this one triggering panic and horror. As we see alluded to in the tweet screenshot below from 'Nick Short', was the same person working the shift within Hawaii's department of emergency management back in 2017 who also made the mistake heard around the world on January 13th of 2018? And is the 8:07 a.m. time that both of these mistakes were made somehow significant or just a freakish coincidence? According to videographer Lionel from Lionel Nation as heard in the 1st video below, what happened in Hawaii on Saturday was a BETA test to gauge realtime citizen panic. Yet as we learn within this story, the state of Hawaii and particularly the island of Kauai are the cerebral cortex for all military and defense technology for the entire Pacific, southeast Asia, Korea and China and therefore, a huge potential military target. We also take a look below at this new story from the Organic Prepper which Steve Quayle linked to on his website this morning titled "Why (And How) EVERYONE Should Make a Survival Shelter Plan (+ Printable Checklist)" within which they report "the false alarm in Hawaii yesterday should be an enormous wake-up call. It should inspire everyone, everywhere to make a survival shelter plan." While one headline story over at the Drudge Report Saturday screamed "38 Minutes of Terror" after the 'inexcusable mistake' made by a public official in Hawaii led to a countless number of people into believing they were spending their last few moments upon the Earth, the pictures and videos emerging from the island show the Hawaiian people totally unprepared, with storm drains turned into makeshift bomb shelters, for an event that we all pray never comes. While Hawaii's Democratic Congresswoman Tulsi Gabbard took to twitter to blame President Trump for the fiasco, claiming that Trump isn't taking the North Korean nuclear threat seriously enough to begin direct talks with North Korea to 'de-escalate' and 'denuclearize' Kim Jong Un and his 'hermit kingdom', does anybody really believe that Kim is going to just give up his nuclear weapons, now that NKorea has declared themselves a full nuclear state? As we've reported on ANP time and again, due to policies from past administrations and their hands off approach to North Korea with their policies of appeasement, President Trump has been left in a very real 'Catch 22' situation with even one former Clinton advisor claiming that the fact that North Korea now has nukes isn't President Trump's fault. And while we agree with Gabbard's calls for peace as we see in her Saturday tweet below several hours after the disastrous 'wrong button mistake', as we learn in this entry over at Wikipedia, the people of Hawaii have already been through a massive attack as back on December 7th of 1941 at 7:48 a.m., the Japanese attack upon Pearl Harbor began, another early morning scare that might help to explain why so many felt so powerless at such a critical moment in time. In this new story by Daisy Luther over at the Organic Prepper she reports that while fingers were being pointed at the person who hit the wrong button on Saturday, instantly sending most of the population into a state of hysteria, the overall responsibility is upon us ourselves. As she reported, hardly anyone had a plan for where they would take shelter. This despite the fact that Hawaii has been emphasizing preparation for a North Korean nuclear attack for several months now. Yet if we're waiting for the government to come and save us, Hawaii proves we'll be waiting for a very, very long time. While White House spokeswoman Lindsay Walters claimed "it was purely a state exercise”, the response given by one state representative in Hawaii echoes arguments by preppers that the government isn't coming to save us. Scott Saiki, the House speaker, said the system Hawaii residents have been told to rely on failed miserably. He also took emergency management officials to task for taking 30 minutes to issue a correction, prolonging panic. “Clearly, government agencies are not prepared and lack the capacity to deal with emergency situations,” he said in a statement. While the website Pravda reported back in September of 2016 that the government of Russia had built enough underground bomb shelters to protect 100% of the residents of the city of Moscow, as this June of 2017 story from the NY Post reports, there is plenty of evidence that the only people who'll be protected should nuclear war hit US soil are the 'deep state politicians' who helped to create the mess that the world is in. As Journalist Garrett Graff reports in his 60-year history of the government’s secret Doomsday plans to survive nuclear war in his book called “Raven Rock: The Story of the U.S. Government’s Secret Plan to Save Itself — While the Rest of Us Die”, if you really believe that our government has the American people's best intentions in mind, they've totally fooled you. Yet as we've previously reported on ANP, even North Korea has bomb shelters for their people. As this August of 2017 story from the Daily Mail reported, North Korea has 18 miles worth of the world's deepest underground metro system that just happen to double as a nuclear bomb fallout shelter, meaning most of Pyongyang's residents could use it in the event of a nuclear war. With each train station there named after the Korean revolution including Comrade, Red Star, Glory, Liberation, Signal Fire, Rehabilitation, Victory, Paradise, and Restoration, the Daily Mail story also reports that many of the people of Pyongyang do not fear war with the US or a nuclear attack because of these shelters, certainly much less than we witnessed in Hawaii on Saturday. While thankfully, though there was one massive mistake on Saturday in Hawaii, it was only a mistake and hopefully lessons will be learned from it yet as this new story from the NY Times which the Drudge Report linked to on Sunday reports, "Hawaii False Alarm Hints At Fine Line Between Mishap And Nuclear War". 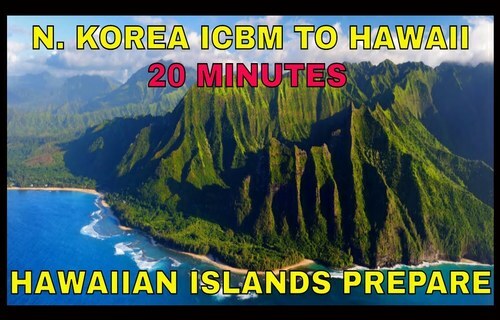 With the state of Hawaii only a 20-minute ICMB flight away from Kim Jong Un and North Korea and the world on edge, 'next time' may not turn out so well. With what is being called 'significant activity' recently being spotted at North Korea's nuclear testing site indicating another test may be forthcoming according to this new story from American Military News, experts warn that the 'catch 22 situation' that President Trump has been cornered into may still play out militarily within the next few months, especially with mysterious submarine activity taking place off of the coast of Hawaii in recent months. As we reported on ANP back on March 9th of 2017, the stakes for America are extremely high in the Pacific region with our Pacific Missile Range Facility at Barking Sands in Hawaii the 'cerebral cortex' of the region along with Pearl Harbor. We also reported then that according to this 2015 study from the Congressional Research Service, Hawaii, South Korea and Japan make up a sort of 'iron triangle' in the Pacific region for US defense, and NKorea can now strike all three. The US military also has a missile defense facility in Guam that is said to 'help the locals sleep well at night' but is also well within range of NKorean missiles. And while we have great faith in the men and women within the military who have quite literally sacrificed their own lives to serve America, as we've previously warned on ANP, high-ranking globalists who will stop at nothing to ensure their own longevity might even be willing to start a nuclear war if it helps them to get out of the mess that they're in. As Steve Quayle warned us of long ago, before God allowed America to be nuked by China or Russia, He'd first reveal the sins of the leaders to the people and the sins of the people before the Holy God. With the state of Hawaii obviously playing a huge role in the Barack Obama birth certificate debacle, might that state somehow be 'in play'? In the 2nd video below our videographer talks with us about the 'Hawaiian missile oops', Julian Assange and the upcoming release of the OIG report that may put James Comey, Loretta Lynch and Hillary Clinton in the crosshairs. The final video below also takes a long look at this bizarre event on Saturday that has the entire country talking about nuclear war and what happens when the wrong button is pushed, what appears to be another attempted globalist jab at President Trump with the nuclear button sitting within his reach and talk of the 25th Amendment insanely filling the air in Washington DC.